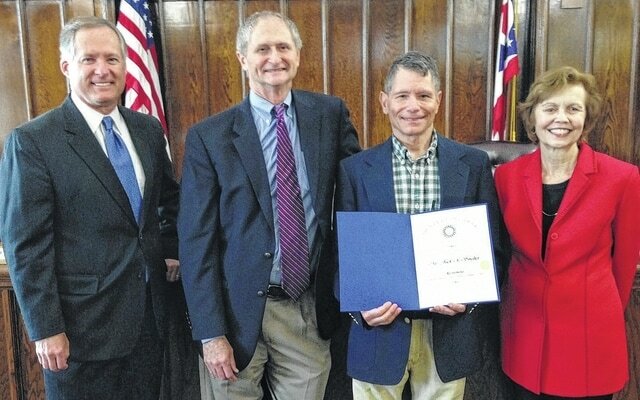 Delaware County commissioners on Thursday paid tribute to Jack Smelker, who is retiring as technical adviser for the county’s regional sewer district, for 36-plus years of service. The county’s director of sanitary engineering, Mike Frommer, said the tag line for an engineer is solving problems and making the world a better place to live. “Jack embodies that,” he said. “The sewer department is like a family,” Frommer said. Smelker is like the dad, the person you go to when you’re not sure what to do, he said. When Frommer first met Smelker, Smelker was a wearing coveralls and was going out to check a flow meter. “He’s definitely always been a working manager-leader and I think that is very important for the group,” Frommer said. Smelker would always run to get his phone if it rang while he was down the hall. “You never heard him say, ‘Let it go to voice mail,’” DeWitt said. Commissioner Gary Merrell offered what he called his highest compliment to Smelker. “I think the strongest character trait you have — so many of us lack — is you’re modest but you get the job done and you don’t look for accolades,” he said. In other business, commissioners considered a draft letter from the Secretary of State’s Office, asking for commissioners’ support of legislation allowing for online voter registration. Commissioners Barb Lewis and Merrell were in support of signing the letter. Commissioner Jeff Benton said online voter registration is a new topic for him and that he would like to study it more before signing the letter. After returning from an executive session, Merrell and Lewis approved a resolution and signed the letter supporting online registration. Benton was absent at that time. County commissioners paid tribute Thursday to Jack Smelker of the county’s sewer district for his 36 plus-years of service to Delaware County. From left to right are Commissioners Jeff Benton and Gary Merrell, Smelker, and Commissioner Barb Lewis.